The fixture list in England is "untenable", says the Football Association after confirming that Arsenal's FA Cup replay with Hull would be played on a Champions League night. Hull City host Arsenal in a fifth-round replay on 8 March (19:00 GMT) but domestic fixtures are not allowed to clash with European competitions. The FA said: "exhaustive discussions" had taken place with Uefa. It added: "The FA recognises that this is not an ideal solution for everyone." 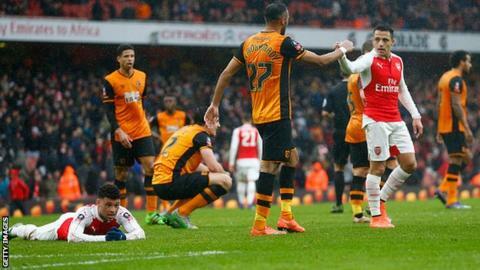 Premier League side Arsenal were held to a goalless draw at home by Championship leaders Hull on 20 February. On the same date as the replay, Real Madrid play Roma and Wolfsburg meet Gent in the second legs of their Champions League last-16 ties. The Gunners will play the second leg of their Champions League tie against Barcelona the following week, on Wednesday, 16 March. They lost the home leg 2-0. The FA said: "It does strengthen the case for footballing bodies to work closely together in a positive, collaborative way to resolve the overcrowded and untenable fixture schedule." It was revealed last week that FA Cup replays could be scrapped in order to trim the fixture list. The FA also has concerns the season leaves the national team tired for major summer tournaments.